This article is about marine protected areas specifically. For protected regions of environmental or cultural value in general, see protected area. Milford Sound, New Zealand is a strict marine reserve (Category Ia) Mitre Peak, the mountain at left, rises 1,692 m (5,551 ft) above the sea. Marine protected areas (MPA) are protected areas of seas, oceans, estuaries or large lakes. These marine areas can come in many forms ranging from wildlife refuges to research facilities. MPAs restrict human activity for a conservation purpose, typically to protect natural or cultural resources. Such marine resources are protected by local, state, territorial, native, regional, national, or international authorities and differ substantially among and between nations. This variation includes different limitations on development, fishing practices, fishing seasons and catch limits, moorings and bans on removing or disrupting marine life. In some situations (such as with the Phoenix Islands Protected Area), MPAs also provide revenue for countries, potentially equal to the income that they would have if they were to grant companies permissions to fish. On 28 October 2016 in Hobart, Australia, the Convention for the Conservation of Antarctic Marine Living Resources agreed to establish the first Antarctic and largest marine protected area in the world encompassing 1.55 million km2 (600,000 sq mi) in the Ross Sea. Other large MPAs are in the Indian, Pacific, and Atlantic Oceans, in certain exclusive economic zones of Australia and overseas territories of France, the United Kingdom and the United States, with major (990,000 square kilometres (380,000 sq mi) or larger) new or expanded MPAs by these nations since 2012—such as Natural Park of the Coral Sea, Pacific Remote Islands Marine National Monument, Coral Sea Commonwealth Marine Reserve and South Georgia and the South Sandwich Islands Marine Protected Area. When counted with MPAs of all sizes from many other countries, as of August 2016 there are more than 13,650 MPAs, encompassing 2.07% of the world's oceans, with half of that area – encompassing 1.03% of the world's oceans – receiving complete "no-take" designation. "Any area of the intertidal or subtidal terrain, together with its overlying water and associated flora, fauna, historical and cultural features, which has been reserved by law or other effective means to protect part or all of the enclosed environment." "Any area of the marine environment that has been reserved by federal, state, tribal, territorial, or local laws or regulations to provide lasting protection for part or all of the natural and cultural resources therein." "Any defined area within or adjacent to the marine environment, together with its overlying water and associated flora, fauna, historical and cultural features, which has been reserved by legislation or other effective means, including custom, with the effect that its marine and/or coastal biodiversity enjoys a higher level of protection than its surroundings." 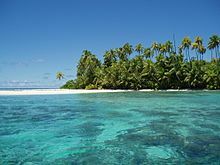 The Chagos Archipelago was declared the world's largest marine reserve in April 2010 with an area of 250,000 square miles until March 2015 when It was declared illegal by the Permanent Court of Arbitration. A totally marine area with no significant terrestrial parts. An area containing both marine and terrestrial components, which can vary between two extremes; those that are predominantly maritime with little land (for example, an atoll would have a tiny island with a significant maritime population surrounding it), or that is mostly terrestrial. Marine ecosystems that contain land and intertidal components only. For example, a mangrove forest would contain no open sea or ocean marine environment, but its river-like marine ecosystem nevertheless complies with the definition. A marine reserve usually connotes "maximum protection", where all resource removals are strictly prohibited. In countries such as Kenya and Belize, marine reserves allow for low-risk removals to sustain local communities. Marine parks emphasize the protection of ecosystems but allow light human use. A marine park may prohibit fishing or extraction of resources, but allow recreation. Some marine parks, such as those in Tanzania, are zoned and allow activities such as fishing only in low risk areas. Established to protect historical sites such as shipwrecks and cultural sites such as aboriginal fishing grounds. Established to protect a certain species, to benefit fisheries, rare habitat, as spawning/nursing grounds for fish, or to protect entire ecosystems. Limited active management, as with protected landscapes. World Heritage Site (WHS) – an area exhibiting extensive natural or cultural history. Maritime areas are poorly represented, however, with only 46 out of over 800 sites. Man and the Biosphere – UNESCO program that promotes "a balanced relationship between humans and the biosphere". Under article 4, biosphere reserves must "encompass a mosaic of ecological systems", and thus combine terrestrial, coastal, or marine ecosystems. In structure they are similar to Multiple-use MPAs, with a core area ringed by different degrees of protection. Ramsar site – must meet certain criteria for the definition of "Wetland" to become part of a global system. These sites do not necessarily receive protection, but are indexed by importance for later recommendation to an agency that could designate it a protected area. "A collection of individual MPAs operating cooperatively, at various spatial scales and with a range of protection levels that are designed to meet objectives that a single reserve cannot achieve." At the 2004 Convention on Biological Diversity, the agency agreed to use "network" on a global level, while adopting system for national and regional levels. The network is a mechanism to establish regional and local systems, but carries no authority or mandate, leaving all activity within the "system". No take zones (NTZs), are areas designated in a number of the world's MPAs, where all forms of exploitation are prohibited and severely limits human activities. These no take zones can cover an entire MPA, or specific portions. For example, the 1,150,000 square kilometres (440,000 sq mi) Papahānaumokuākea Marine National Monument, the world's largest MPA (and largest protected area of any type, land or sea), is a 100% no take zone. Related terms include; specially protected area (SPA), Special Area of Conservation (SAC), the United Kingdom's marine conservation zones (MCZs), or area of special conservation (ASC) etc. which each provide specific restrictions. Stressors that affect oceans include "the impact of extractive industries, localised pollution, and changes to its chemistry (ocean acidification) resulting from elevated carbon dioxide levels, due to our emissions". MPAs have been cited as the ocean's single greatest hope for increasing the resilience of the marine environment to such stressors. Well-designed and managed MPAs developed with input and support from interested stakeholders can conserve biodiversity and protect and restore fisheries. MPAs can help sustain local economies by supporting fisheries and tourism. For example, Apo Island in the Philippines made protected one quarter of their reef, allowing fish to recover, jumpstarting their economy. This was shown in the film, Resources at Risk: Philippine Coral Reef. A 2016 report by the Center for Development and Strategy found that programs like the United States National Marine Sanctuary system can develop considerable economic benefits for communities through Public–private partnerships. Typical MPAs restrict fishing, oil and gas mining and/or tourism. Other restrictions may limit the use of ultrasonic devices like sonar (which may confuse the guidance system of cetaceans), development, construction and the like. Some fishing restrictions include "no-take" zones, which means that no fishing is allowed. Less than 1% of US MPAs are no-take. Ship transit can also be restricted or banned, either as a preventive measure or to avoid direct disturbance to individual species. The degree to which environmental regulations affect shipping varies according to whether MPAs are located in territorial waters, exclusive economic zones, or the high seas. The law of the sea regulates these limits. Seasonal and temporary management—Activities, most critically fishing, are restricted seasonally or temporarily, e.g., to protect spawning/nursing grounds or to let a rapidly reducing species recover. Multiple-use MPAs—These are the most common and arguably the most effective. These areas employ two or more protections. The most important sections get the highest protection, such as a no take zone and are surrounded with areas of lesser protections. Community involvement and related approaches—Community-managed MPAs empower local communities to operate partially or completely independent of the governmental jurisdictions they occupy. Empowering communities to manage resources can lower conflict levels and enlist the support of diverse groups that rely on the resource such as subsistence and commercial fishers, scientists, recreation, tourism businesses, youths and others. Marine Protected Area Networks or MPA networks have been defined as "A group of MPAs that interact with one another ecologically and/or socially form a network". These networks are intended to connect individuals and MPAs and promote education and cooperation among various administrations and user groups. "MPA networks are, from the perspective of resource users, intended to address both environmental and socio-economic needs, complementary ecological and social goals and designs need greater research and policy support". Filipino communities connect with one another to share information about MPAs, creating a larger network through the social communities' support. Emerging or established MPA networks can be found in Australia, Belize, the Red Sea, Gulf of Aden and Mexico. the establishment of marine protected areas consistent with international laws and based on scientific information, including representative networks by 2012. By 2006 complete an area system gap analysis at national and regional levels. By 2008 address the less represented marine ecosystems, accounting for those beyond national jurisdiction in accordance. By 2009 designate the protected areas identified through the gap analysis. By 2012 complete the establishment of a comprehensive and ecologically representative network. Bunaken Marine Park, Indonesia is officially listed as both a marine reserve and a national marine park. "The establishment by 2010 of terrestrial and by 2012 for marine areas of comprehensive, effectively managed, and ecologically representative national and regional systems of protected areas that collectively, inter alia through a global network, contribute to achieving the three objectives of the Convention and the 2010 target to significantly reduce the current late of biodiversity loss at the global, regional, national, and sub-national levels and contribute to poverty reduction and the pursuit of sustainable development." Effective conservation of 10% of each of the world's ecological regions by 2010. On 7 April 1982, the Convention on the Conservation of Antarctic Marine Living Resources (CAMLR Convention) came into force after discussions began in 1975 between parties of the then-current Antarctic Treaty to limit large-scale exploitation of krill by commercial fisheries. The Convention bound contracting nations to abide by previously agreed upon Antarctic territorial claims and peaceful use of the region while protecting ecosystem integrity south of the Antarctic Convergence and 60 S latitude. In so doing, it also established a commission of the original signatories and acceding parties called the Commission for the Conservation of Antarctic Marine Living Resources (CCAMLR) to advance these aims through protection, scientific study, and rational use, such as harvesting, of those marine resources. Though separate, the Antarctic Treaty and CCAMLR, make up part the broader system of international agreements called the Antarctic Treaty System. Since 1982, the CCAMLR meets annually to implement binding conservations measures like the creation of 'protected areas' at the suggestion of the convention's scientific committee. In 2009, the CCAMLR created the first 'high-seas' MPA entirely within international waters over the southern shelf of the South Orkney Islands. This area encompasses 94,000 square kilometres (36,000 sq mi) and all fishing activity including transhipment, and dumping or discharge of waste is prohibited with the exception of scientific research endeavors. On 28 October 2016, the CCAMLR, composed of 24 member countries and the European Union at the time, agreed to establish the world's largest marine park encompassing 1.55 million km2 (600,000 sq mi) in the Ross Sea after several years of failed negotiations. Establishment of the Ross Sea MPA required unanimity of the commission members and enforcement will begin in December 2017. However, due to a sunset provision inserted into the proposal, the new marine park will only be in force for 35 years. Bahamas 20% of the marine ecosystem protected for fishery replenishment by 2010. 20% of coastal and marine habitats by 2015. 60% of turtle nesting sites. 60% of American crocodile nesting. Chile 10% of marine areas by 2010. National network for organization by 2015. Dominican Republic 20% of marine and coastal by 2020. Micronesia 30% of shoreline ecosystems by 2020. Isle of Man 10% of Manx waters as 'effectively managed, ecologically representative and well-connected protected areas and other effective area-based conservation measures' by 2020. As of June 2016, approximately 3% of Manx waters were protected as a Marine Nature Reserve, with additional areas subject to seasonal or temporary protection. Marshal Islands 30% of nearby marine ecosystem by 2020. New Zealand 20% of marine environment by 2010. North Mariana Islands 30% of nearby marine ecosystem by 2020. Palau 30% of nearby marine ecosystem by 2020. Peru Marine protected area system established by 2015. Philippines 10% fully protected by 2020. St. Vincent and the Grenadines 20% of marine areas by 2020. United Kingdom Establish an ecologically coherent network of marine protected areas by 2012. United States – California 29 MPAs covering 18% of state marine area with 243 square kilometres (94 sq mi) at maximum protection. The marine protected area network is still in its infancy. As of October 2010, approximately 6,800 MPAs had been established, covering 1.17% of global ocean area. Protected areas covered 2.86% of exclusive economic zones (EEZs). MPAs covered 6.3% of territorial seas. Many prohibit the use of harmful fishing techniques yet only 0.01% of the ocean's area is designated as a "no take zone". This coverage is far below the projected goal of 20%-30% Those targets have been questioned mainly due to the cost of managing protected areas and the conflict that protections have generated with human demand for marine goods and services. A marine protected area of South Africa is an area of coastline or ocean within the exclusive economic zone (EEZ) of the Republic of South Africa that is protected in terms of specific legislation. There are a total of 45 marine protected areas in the South African EEZ, with a total area of 5% of the waters. The target is to have 10% of the oceanic waters protected by 2020. All but one of the MPAs are in the coastal waters off continental South Africa, and one is off Prince Edward Island in the Southern Ocean. The Gulf of Mexico region (in 3D) is encompassed[clarification needed] by the "Islands in the Stream" proposal. The Greater Caribbean subdivision encompasses an area of about 5,700,000 square kilometres (2,200,000 sq mi) of ocean and 38 nations. The area includes island countries like the Bahamas and Cuba, and the majority of Central America. The Convention for Protection and Development of the Marine Environment of the Wider Caribbean Region (better known as the Cartagena Convention) was established in 1983. Protocols involving protected areas were ratified in 1990. As of 2008, the region hosted about 500 MPAs. Coral reefs are the best represented. Two networks are under development, the Mesoamerican Barrier Reef System (a long barrier reef that borders the coast of much of Central America), and the "Islands in the Stream" program (covering the Gulf of Mexico). Southeast Asia is a global epicenter for marine diversity. 12% of its coral reefs are in MPAs. The Philippines have some the world's best coral reefs and protect them to attract international tourism. Most of the Philippines' MPAs are established to secure protection for its coral reef and sea grass habitats. Indonesia has MPAs designed for tourism and relies on tourism as a main source of income. The Philippines host one of the most highly biodiverse regions, with 464 reef-building coral species. Due to overfishing, destructive fishing techniques, and rapid coastal development, these are in rapid decline. The country has established some 600 MPAs. However, the majority are poorly enforced and are highly ineffective. However, some have positively impacted reef health, increased fish biomass, decreased coral bleaching and increased yields in adjacent fisheries. One notable example is the MPA surrounding Apo Island. Latin America has designated one large MPA system. As of 2008, 0.5% of its marine environment was protected, mostly through the use of small, multiple-use MPAs. The South Pacific network ranges from Belize to Chile. Governments in the region adopted the Lima convention and action plan in 1981. An MPA-specific protocol was ratified in 1989. The permanent commission on the exploitation and conservation on the marine resources of the South Pacific promotes the exchange of studies and information among participants. The region is currently running one comprehensive cross-national program, the Tropical Eastern Pacific Marine Corridor Network, signed in April 2004. The network covers about 211,000,000 square kilometres (81,000,000 sq mi). One alternative to imposing MPAs on an indigenous population is through the use of Indigenous Protected Areas, such as those in Australia. The North Pacific network covers the western coasts of Mexico, Canada, and the U.S. The "Antigua Convention" and an action plan for the north Pacific region were adapted in 2002. Participant nations manage their own national systems. In 2010-2011, the State of California completed hearings and actions via the state Department of Fish and Game to establish new MPAs. President Barack Obama signed a proclamation on September 25, 2014, designating the world's largest marine reserve. The proclamation expanded the existing Pacific Remote Islands Marine National Monument, one of the world's most pristine tropical marine environments, to six times its current size, encompassing 490,000 square miles (1,300,000 km2) of protected area around these islands. Expanding the Monument protected the area's unique deep coral reefs and seamounts. Diagram illustrating the orientation of the 3 marine sanctuaries of Central California: Cordell Bank, Gulf of the Farallones, and Monterey Bay. Davidson Seamount, part of the Monterey Bay sanctuary, is indicated at bottom-right. In April 2009, the US established a United States National System of Marine Protected Areas, which strengthens the protection of US ocean, coastal and Great Lakes resources. These large-scale MPAs should balance "the interests of conservationists, fishers, and the public." As of 2009, 225 MPAs participated in the national system. Sites work together toward common national and regional conservation goals and priorities. NOAA's national marine protected areas center maintains a comprehensive inventory of all 1,600+ MPAs within the US exclusive economic zone. Most US MPAs.allow some type of extractive use. Fewer than 1% of U.S. waters prohibit all extractive activities. Meets the definition of an MPA as defined in the Framework. Has a management plan (can be sitespecific or part of a broader programmatic management plan; must have goals and objectives and call for monitoring or evaluation of those goals and objectives). Contributes to at least one priority conservation objective as listed in the Framework. Cultural heritage MPAs must also conform to criteria for the National Register for Historic Places." In 1999, California adopted the Marine Life Protection Act, establishing the first state law requiring a comprehensive, science-based MPA network. The state created the Marine Life Protection Act Initiative. The MLPA Blue Ribbon Task Force and stakeholder and scientific advisory groups ensure that the process uses the science and public participation. The MLPA Initiative established a plan to create California's statewide MPA network by 2011 in several steps. The Central Coast step was successfully completed in September, 2007. The North Central Coast step was completed in 2010. The South Coast and North Coast steps were expected to go into effect in 2012. In exchange for some of its national debt being written off, the Seychelles designates two new marine protected areas in the Indian Ocean, covering about 210,000 square kilometres (81,000 sq mi). It is the result of a financial deal, brokered in 2016 by The Nature Conservancy. There are a number of marine protected areas around the coastline of the United Kingdom, known as Marine Conservation Zones in England, Wales, and Northern Ireland, Marine Protection Areas in Scotland. They are to be found in inshore and offshore waters. The United Kingdom is also creating marine protected reserves around several British Overseas Territories. The UK is responsible for 6.8 million square kilometres of ocean around the world, larger than all but four other countries. The Chagos Marine Protected Area in the Indian Ocean was established in 2010 as a "no-take-zone". With a total surface area of 640,000 square kilometres (250,000 sq mi), it was the world's largest contiguous marine reserve. In March 2015, the UK announced the creation of a marine reserve around the Pitcairn Islands in the Southern Pacific Ocean to protect its special biodiversity. The area of 830,000 square kilometres (320,000 sq mi) surpassed the Chagos Marine Protected Area as the world's largest contiguous marine reserve, until the August 2016 expansion of the Papahānaumokuākea Marine National Monument in the United States to 1,510,000 square kilometres (580,000 sq mi). In January 2016, the UK government announced the intention to create a marine protected area around Ascension Island. The protected area will be 234,291 square kilometres (90,460 sq mi), half of which will be closed to fishing. The Natura 2000 ecological MPA network in the European Union included MPAs in the North Atlantic, the Mediterranean Sea and the Baltic Sea. The member states had to define NATURA 2000 areas at sea in their Exclusive Economic Zone. Two assessments, conducted thirty years apart, of three Mediterranean MPAs, demonstrate that proper protection allows commercially valuable and slow-growing red coral (Corallium rubrum) to produce large colonies in shallow water of less than 50 metres (160 ft). Shallow-water colonies outside these decades-old MPAs are typically very small. The MPAs are Banyuls, Carry-le-Rouet and Scandola, off the island of Corsica. The Bowie Seamount Marine Protected Area off the coast of British Columbia, Canada. The Great Barrier Reef Marine Park in Queensland, Australia. The Ligurian Sea Cetacean Sanctuary in the seas of Italy, Monaco and France. The Dry Tortugas National Park in the Florida Keys, USA. The Phoenix Islands Protected Area, Kiribati. The Channel Islands National Marine Sanctuary in California, USA. The Chagos Marine Protected Area in the Indian Ocean. The Wadden Sea bordering the North Sea in the Netherlands, Germany, and Denmark. The Prickly Pear Cays are a marine protected area, roughly six miles from Road Bay, Anguilla, in the Leeward Islands of the Caribbean. Managers and scientists use geographic information systems and remote sensing to map and analyze MPAs. NOAA Coastal Services Center compiled an "Inventory of GIS-Based Decision-Support Tools for MPAs." The report focuses on GIS tools with the highest utility for MPA processes. Remote sensing uses advances in aerial photography image capture, pop-up archival satellite tags, satellite imagery, acoustic data, and radar imagery. Mathematical models that seek to reflect the complexity of the natural setting may assist in planning harvesting strategies and sustaining fishing grounds. Coral reef systems have been in decline worldwide. Causes include overfishing, pollution and ocean acidification. As of 2013 30% of the world's reefs were severely damaged. Approximately 60% will be lost by 2030 without enhanced protection. Marine reserves with "no take zones" are the most effective form of protection. Only about 0.01% of the world's coral reefs are inside effective MPAs. MPAs can be an effective tool to maintain fish populations; see refuge (ecology). The general concept is to create overpopulation within the MPA. The fish expand into the surrounding areas to reduce crowding, increasing the population of unprotected areas. This helps support local fisheries in the surrounding area, while maintaining a healthy population within the MPA. Such MPAs are most commonly used for coral reef ecosystems. One example is at Goat Island Bay in New Zealand, established in 1977. Research gathered at Goat Bay documented the spillover effect. "Spillover and larval export—the drifting of millions of eggs and larvae beyond the reserve—have become central concepts of marine conservation". This positively impacted commercial fishermen in surrounding areas. Another unexpected result of MPAs is their impact on predatory marine species, which in some conditions can increase in population. When this occurs, prey populations decrease. One study showed that in 21 out of 39 cases, "trophic cascades," caused a decrease in herbivores, which led to an increase in the quantity of plant life. (This occurred in the Malindi Kisite and Watamu Marian National Parks in Kenya; the Leigh Marine Reserve in New Zealand; and Brackett's Landing Conservation Area in the US. Adequacy—ensuring that the sites have the size, shape, and distribution to ensure the success of selected species. Resilience—the resistance of the system to natural disaster, such as a tsunami or flood. Connectivity—maintaining population links across nearby MPAs. Misconceptions about MPAs include the belief that all MPAs are no-take or no-fishing areas. However, less than 1 percent of US waters are no-take areas. MPA activities can include consumption fishing, diving and other activities. Another misconception is that most MPAs are federally managed. Instead, MPAs are managed under hundreds of laws and jurisdictions. They can be exist in state, commonwealth, territory and tribal waters. Another misconception is that a federal mandate dedicates a set percentage of ocean to MPAs. Instead the mandate requires an evaluation of current MPAs and creates a public resource on current MPAs. Some existing and proposed MPAs have been criticized by indigenous populations and their supporters, as impinging on land usage rights. For example, the proposed Chagos Protected Area in the Chagos Islands is contested by Chagossians deported from their homeland in 1965 by the British as part of the creation of the British Indian Ocean Territory (BIOT). According to WikiLeaks CableGate documents, the UK proposed that the BIOT become a "marine reserve" with the aim of preventing the former inhabitants from returning to their lands and to protect the joint UK/US military base on Diego Garcia Island. Other critiques include: their cost (higher than that of passive management), conflicts with human development goals, inadequate scope to address factors such as climate change and invasive species. The larvae of the yellow tang can drift more than 100 miles and reseed in a distant location. In 2010, one study found that fish larvae can drift on ocean currents and reseed fish stocks at a distant location. This finding demonstrated that fish populations can be connected to distant locations through the process of larval drift. They investigated the yellow tang, because larva of this species stay in the general area of the reef in which they first settle. 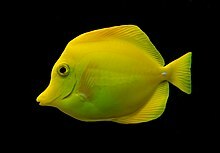 The tropical yellow tang is heavily fished by the aquarium trade. By the late 1990s, their stocks were collapsing. Nine MPAs were established off the coast of Hawaii to protect them. Larval drift has helped them establish themselves in different locations, and the fishery is recovering. "We've clearly shown that fish larvae that were spawned inside marine reserves can drift with currents and replenish fished areas long distances away," said coauthor Mark Hixon. ^ "Milford Sound Marine Reserve". Protectedplanet.net. Retrieved 2012-06-07. ^ Administration, US Department of Commerce, National Oceanic and Atmospheric. "What is a marine protect?". oceanservice.noaa.gov. Retrieved 2018-02-05. ^ "Marine Protected Areas". National Ocean Service. National Oceanic and Atmospheric Administration. Retrieved 2016-09-02. ^ "CCAMLR to create world's largest Marine Protected Area". Convention for the Conservation of Antarctic Marine Living Resources. 28 October 2016. Retrieved 28 October 2016. ^ "Explore". MPAtlas. Marine Conservation Institute. Retrieved 2016-09-02. ^ "Marine protected areas, why have them?". IUCN. 2010-02-01. Archived from the original on 2012-03-19. Retrieved 2012-06-07. ^ "Towards Networks of Marine Protected Areas - The MPA Plan of Action for IUCN's World Commission on Protected Areas". IUCN. 2008-11-04. Archived from the original on 2012-05-22. Retrieved 2012-06-07. ^ "Nomination of Existing Marine Protected Areas to the National System of Marine Protected Areas and Updates to the List of National System Marine Protected Areas". Federalregister.gov. Retrieved 2012-06-07. ^ "Man and the Biosphere Programme". UNESCO. Retrieved 2012-06-07. ^ "Papahānaumokuākea (Expansion) Marine National Monument, United States". MPAtlas. Marine Conservation Institute. Archived from the original on 2016-09-23. Retrieved 2016-09-02. ^ "Marine Conservation Zones". Naturalengland.org.uk. Retrieved 2012-06-07. ^ Laffoley, D. d'A., (ed.) 2008. Towards Networks of Marine Protected Areas. The MPA Plan of Action for IUCN's World Commission on Protected Areas. IUCN WCPA, Gland, Switzerland. 28 pp. ^ a b Christie, P. and A.T. White. 2007. Best practices for improved governance of coral reef marine protected areas. Coral Reefs 26:1047-1056. ^ Harary, David. "Joint-Value Creation Between Marine Protected Areas and the Private Sector" (PDF). thinkcds.org. Center for Development and Strategy. Retrieved 26 July 2016. ^ "Marine Protected Area Networks". Unep-Wcmc. 2011-01-18. Archived from the original on 2011-12-20. Retrieved 2012-06-07. ^ "Asinara Natural Marine Reserve". Protectedplanet.net. Archived from the original on 2012-06-08. Retrieved 2012-06-07. ^ a b c d Christie, P., and A. T. White. "Best Practices for Improved Governance of Coral Reef Marine Protected Areas." Coral Reefs 26.4 (2007): 1047-056. Print. ^ Lowry, G. K., A. T. White, and P. Christie. "Scaling Up to Networks of Marine Protected Areas in the Philippines: Biophysical, Legal, Institutional, and Social Considerations." Coastal Management 37.3 (2009): 274-90. Print. ^ Wells, S. (23 May 2018). "National and Regional Networks of Marine Protected Areas: A Review of Progress". UNEP-WCMC / UNEP – via Internet Archive. ^ "Bunaken Marine Park". Protectedplanet.net. Retrieved 2012-06-07. ^ "United Nations Framework Convention on Climate Change, Decision VII/28". Cbd.int. Retrieved 2012-06-07. ^ "United Nations Framework Convention on Climate Change, Decision VII/15". Cbd.int. Retrieved 2012-06-07. ^ "CCAMLR to create world's largest Marine Protected Area". Commission for the Conservation of Antarctic Marine Living Resources. 29 October 2016. Retrieved 29 October 2016. ^ "Global Ocean Protection: Present Status and Future Possibilities". Iucn.org. 2010-11-23. Retrieved 2012-06-07. ^ "UN (2010) Millennium Development Goals Report – Addendum". Mdgs.un.org. Archived from the original on 2017-09-27. Retrieved 2012-06-07. ^ Christie, Patrick, and A.T White. "Best practices for improved governance of coral reef marine protected areas." (2007): 1048-1056. Print. ^ Halpern, B. (2003). "The impact of marine reserves: do reserves work and does reserve size matter?". Ecological Applications. 13: 117–137. doi:10.1890/1051-0761(2003)013[0117:TIOMRD]2.0.CO;2. ^ a b Mora, C; Sale, P (2011). "Ongoing global biodiversity loss and the need to move beyond protected areas: A review of the technical and practical shortcoming of protected areas on land and sea" (PDF). Marine Ecology Progress Series. 434: 251–266. doi:10.3354/meps09214. ^ Wooda, Louisa J.; Fisha, Lucy; Laughrena, Josh; Pauly, Daniel (2008). "Assessing Progress Towards Global Marine Protection Targets: Shortfalls in Information and Action". Oryx. 42 (3): 340–351. doi:10.1017/S003060530800046X. ^ "Protecting the ocean". www.marineprotectedareas.org.za. Retrieved 18 January 2019. ^ "Summary Report for MPAs in the Philippines" (PDF). reefbase.org. ^ a b "Marine Protected Areas Government Website". Mpa.gov. 2012-05-07. Archived from the original on 2012-06-06. Retrieved 2012-06-07. ^ www.cognitiveDesign.net (1981-01-01). "Olympic National Park World Heritage Site - a Marine Protected Area in USA (contiguous states) - Overview". MPA Global. Retrieved 2012-06-07. ^ a b "Notices: Nomination of Existing Marine Protected Areas to the National System of Marine » Federal Register [FR Doc E9-31406]". Thefederalregister.com. Retrieved 2012-06-07. ^ "Seychelles starts 'Britain-sized' reserve". 22 February 2018 – via www.bbc.co.uk. ^ "Seychelles designates huge new marine reserve". phys.org. ^ "Marine Protected Areas around the UK". The Wildlife Trusts. Retrieved 19 March 2015. ^ "Protecting and sustainably using the marine environment". UK Government. 30 January 2015. Retrieved 19 March 2015. ^ "Map". UK Marine Protected Areas Centre. Retrieved 19 March 2015. "Marine Protected Areas in the UK". Joint Nature Conservation Committee. Retrieved 19 March 2015. ^ "Conservationists call for UK to create world's largest marine reserve". The Guardian. 15 February 2015. Retrieved 4 January 2016. ^ "Chagos Marine Reserve, British Indian Ocean Territory". Marine Reserves Coalition. Archived from the original on 2 April 2015. Retrieved 19 March 2015. ^ "Chagos Marine Reserve". Chagos Conservation Trust. Archived from the original on 5 July 2012. Retrieved 19 March 2015. ^ "World's Largest Single Marine Reserve Created in Pacific". National Geographic. World’s Largest Single Marine Reserve Created in Pacific. 18 March 2015. Retrieved 19 March 2015. ^ "Pitcairn Islands get huge marine reserve". BBC. 18 March 2015. Retrieved 19 March 2015. "Pitcairn Islands to get world's largest single marine reserve". The Guardian. 18 March 2015. Retrieved 19 March 2015. ^ "Ascension Island to become marine reserve". BBC. 3 January 2016. Retrieved 3 January 2016. ^ "Marine Protected Areas Conserve Mediterranean Red Coral". Science Daily. May 11, 2010. Retrieved June 11, 2010. ^ "7 peace parcs proposed by CIESM". Magazine.nationalgeographic.nl. Archived from the original on 2011-02-28. Retrieved 2012-06-07. ^ "Conservation International – World's Largest Marine Protected Area Created in Pacific Ocean". Conservation.org. Retrieved 2012-06-07. ^ Smith & Miller 2003. ^ North Sea Marine Cluster. "Managing Marine Protected Areas" (PDF). NSMC. Archived from the original (PDF) on 30 May 2013. Retrieved 11 February 2013. ^ Berezansky, L.; Idels, L.; Kipnis, M. (2011). "Mathematical model of marine protected areas". IMA Journal of Applied Mathematics. 76 (2): 312–325. doi:10.1093/imamat/hxq043. ISSN 0272-4960. Preprint: http://hdl.handle.net/10613/2741. ^ Pandolfi, J.M. ; et al. (2003). "Global trajectories of long-term decline of coral reef ecosystems". Science. 301 (5635): 955–958. doi:10.1126/science.1085706. PMID 12920296. ^ Hughes, T.P. ; et al. (2003). "Climate change, human impacts, and the resilience of coral reefs". Science. 301 (5635): 929–933. doi:10.1126/science.1085046. PMID 12920289. ^ Mora C.; Andrèfouët, S; Costello, M. J.; Kranenburg, C; Rollo, A; Veron, J; Gaston, K. J.; Myers, R. A.; et al. (2006). "Coral reefs and the global network of Marine Protected Areas" (PDF). Science. 312 (5781): 1750–1751. doi:10.1126/science.1125295. PMID 16794065. ^ Warne, Kennedy. "Saving the Sea's Bounty"] National Geographic. April 2007. "A clearly defined geographical space, recognized, dedicated, and managed, through legal or effective means, to achieve the long-term conservation of nature with associated ecosystem service and cultural value." ^ "WikiLeaks reveals U.S., British use marine reserves as tool of imperialism". Embassy London. 2009-05-15. Retrieved 2010-12-24. ^ a b c Drifting Fish Larvae Allow Marine Reserves to Rebuild Fisheries ScienceDaily , 26 December 2010. Wells, Sue; Sheppard, V.; van Lavieren, H.; Barnard, N.; Kershaw, F.; Corrigan, C.; Teleki, K.; Stock, P.; Adler, E. (2008). "National and Regional Networks of Marine Protected Areas:A Review of Progress". Master Evaluation for the UN Effort. World Conservation Monitoring Centre The Americas. Retrieved 2009-03-18. Smith, D.; Miller, K.A. (2003). Norton, S.F. (ed.). "Safe Harbors for our Future: An Overview of Marine Protected Areas". Diving for Science. Proceedings of the American Academy of Underwater Sciences (22nd Annual Scientific Diving Symposium). Retrieved 2008-08-13. Australian Government, Department of the Environment and Water Resources (May 2007). Growing up strong: The first 10 years of Indigenous Protected Areas in Australia (PDF). Canberra: Australian Government. ISBN 978-0642553522. Retrieved 2008-05-08. Spadi, Fabio (2000). "Navigation in Marine Protected Areas: National and International Law". Ocean Development and International Law. 31 (3): 285–302. doi:10.1080/009083200413172. Moustakas, A.; Karakassis, I. (2005). "How diverse is aquatic biodiversity research?". Aquatic Ecology. 39 (3): 367–375. doi:10.1007/s10452-005-6041-y. Moustakas, A.; Karakassis, I. (2009). "A geographic analysis of the published aquatic biodiversity research in relation to the ecological footprint of the country where the work was done". Stochastic Environmental Research and Risk Assessment. 23 (6): 737–748. doi:10.1007/s00477-008-0254-2. Christie, Patrick, "Marine Protected Areas and Biological Successes and Social Failures in Southeast Asia." School of Marine Affairs and Henry M. Jackson School of International Studies. University of Washington. Washington. January 5, 2004. MPAtlas.org is an online tool from the Marine Conservation Institute that provides information on the world’s protected areas and global MPA campaigns. Information comes from a variety of sources, including the World Database on Protected Areas (WDPA), and many regional and national databases. Marine protected areas are included on the WDPA, which, since 2010 is viewable via Protected Planet, an online interactive search engine hosted by the United Nations Environment Programme's World Conservation Monitoring Center (UNEP-WCMC).